Bienvenido a Cuba! Welcome to Cuba! A complimentary arrival transfer is included with your trip. Please ensure you provide your flight details to your booking agent at least 14 days prior to travel so the transfer can be organised. Upon arrival, soak in the decaying beauty of Havana and the surreal feeling that you have entered a bygone era. This is a very historic time to visit Cuba, as the gates finally creak open to a country so long forbidden. There will be a welcome meeting at approximately 6pm this evening. Please expect a letter from your leader in the afternoon of Day 1 to confirm the place of your meeting (if by 5pm you cannot locate this letter then please ask your guesthouse owner if one has been delivered, or ask to call our assistance line listed in the "Problems and emergency contact information" section of this document). We'll be collecting your insurance details and next of kin information at this meeting, so ensure you have all these details to provide to your leader. Dinner tonight will be at a local paladar, a privately owned restaurant and a great example of Cuba’s incremental shift to a more free-market economy. Paladar means “palate” and is named after a chain of restaurants in a Brazilian soap opera popular in Cuba. In the morning, see outer-Havana in a convoy of classic American vintage cars for a Havana city tour (1 hour urban adventure) that cruises via points of intrerest such as the Malecon, Avenida de los presidentes, Revolution Square, and get dropped off in Old Havana. Next, join your leader for a walking tour of Old Havana (approximately 2.5 hours). The best place to start any Havana experience is in the Old City; it is one of the best preserved and was designated a World Heritage Site in 1982. The streets are lined with colonial architecture, 16th century fortresses and countless churches. Visit La Catedral San Cristobal de la Habana, the Palacio de los Marqueses de Aguas Claras and the Plaza de Armas. There will be time lunch before visiting Museo de la Revolucion, to learn about the history of the Cuban Revolution and see the infamous Hall of Cretins. Today about 8am, head east, first stopping in an outer-Havana suburb to see the passion project of Jose Fuster, an artist who has turned an entire neighborhood into a lively and colorful series of mosaics. Known as 'Fusterlandia', the inspiring and whimsical scenery is a perfect spot for pictures, and potentially have the chance to say 'hola' to the artist as he works! Continue on to a local community in Las Terrazas (approximately two hours). The village was built as part of a government reforestation project and has since received a UNESCO biosphere listing. Meet up with local community leaders who will share some insight into Las Terrazas and how the society works. Also visit the ecological research centre and take a guided walk around the complex. After lunch continue with a two hour drive to Vinales - situated in one of the most picturesque parts of Cuba, among the limestone pincushion hills (“mogotes”) of the Pinar del Rio province. It is a small and culturally rich village, with friendly and welcoming residents. Reach Vinales in time for a quick orientation walk then head to an organic farm and learn about sustainable farming in Cuba. Hopefully meet local farmer Wilfredo Garcia Correa or at least his family who will show us around the farm and explain the methods used to cultivate crops without the use of pesticides. Hopefully with a beautiful sunset as our backdrop, enjoy a deliciously fresh and diverse meal prepared by the family, a truly authentic farm-to-fork experience! Today at 9am spend the morning (approximately three hours) learning more about Cuban agriculture with a visit to a local tobacco farm to learn about the tradition of Cuban cigars. Get an insight as to how the communist system works, how much tobacco they keep, how much produce they give back to the government, how they make ends meet!! Learn about the process of tobacco planting to rolling the final cigar. Share in the secret recipe from one family passed down through three generations of how they cure their leaves for cigars, drink some freshly roasted coffee from the farm while watching an expert roll cigars. In the afternoon, firstly partake in a salsa dance class (one hour) with a local teacher, then a cooking demonstration from a local chef. Vinales is one of the more agriculturally productive areas of Cuba, so an abundance of local seasonal fruit and vegetables are always on offer such as enormous avocados and mangoes, pineapples, papaya, guava, and several varieties of sweet potatoes. Sit back, relax and enjoy the well prepared meal while overlooking the rolling mountains of Vinales. Today head to Cienfuegos at 8am with the bulk of the driving done first (approximately 4.5 hours). After lunch, we visit the Korimakao Cultural Project in Ciénega de Zapata, an area famous for its wetlands. Korimakao is a project founded in 1992 to bring theatre, music, and dancing to remote areas of Cuba. Here meet a director of the project, who will talk to us about the importance of this project and the number of students that benefit from such a project in this area. Then drive along the picturesque Bay of Pigs where there are some beautiful places to stop for a swim along the way including a sink hole which resembles a huge natural tropical fish tank, so make sure to pack your swim wear and snorkeling gear if you have any (or rent it!). Next we pass the site where the landing of U.S. sponsored counter-revolutionary exile militia occurred in 1961. Today there is a museum here that recounts the events of this conflict which resulted in the first defeat of a U.S backed take-over in Latin America. Drive for one more hour or so, arriving around 5:30pm into Cienfuegos the “Pearl of the South”, a city founded by the French, which lends it a distinctly European flavor, with a wide Parisian-style boulevard and elegant colonnades. Like Havana, Cienfuegos has a beautiful Malecón, where anyone can pass a peaceful evening watching fisherman cast nets and locals socialize. In the evening join together for another delicious home cooked meal with a local family. This morning about 8:30am your leader will show you around Cienfuegos before getting back on the road at approximately 10am to head to the beautiful colonial city of Trinidad (approximately 1.5-2 hours). Trinidad is home to numerous churches and many beautiful colonial buildings. Located near the lovely Valle de los Ingenios (Valley of Sugar mills) and Playa Ancón, with long stretches of unspoiled, white sand beaches. After lunch, begin with a guided cultural tour of the UNESCO World Heritage town of Trinidad (approximately three hours). This includes an opportunity to visit various museums such as: Museo Lucha contra Bandidos, Architecture Museum, Museo Romantico. Later, visit the pottery workshop of the Santander family. This prestigious family in the Cuban cultural landscape has been making pottery for generations as well as assisting in the restoration of sculptures that once existed in this UNESCO world heritage site. Take the chance to purchase your own pottery to remind you of your time in Cuba. In the evening, perhaps seek out the dance scene in Cuba. You may wish to see the Afro Cuban Folkloric dance group that perform shows at the club Palenque; this has cultural and social importance in this region. Nightlife in Trinidad is probably the most accessible and intense in all of Cuba, with numerous live music venues and many dance performances every day of the week, all amongst the enchanting setting of old colonial buildings and the cobblestone streets. Today learn about the history of the area, the local industry and biodiversity. At 9am visit the national park called "El Cubano" in the mountains of Escambay. This area is known for the struggle Cuban Militia against revolutionary forces in the early 1960s. Hike to a small waterfall with our local expert guide. Depending on the group the hike can take up to 45 minutes each way. Have a chance to experience the region's biodiversity utilising the guide's knowledge of the local birds and plants. If time permits on the way stop in a very simple campesino’s home to experience life in the rural areas of Cuba and usually lunch is at the restaurant in the area as well. Return to Trinidad about 2pm. Tonight, usually you’ll have dinner by the beach. Leave Trinidad at 8am to reach the town of Santa Clara (approximately two hours), a key city in the Cuban Revolution. Upon entering Santa Clara, see the iconic statue of Ernesto Ché Guevara, built to commemorate his death and that of the revolutionaries. There will be time to explore the museum which honours Ché's life. 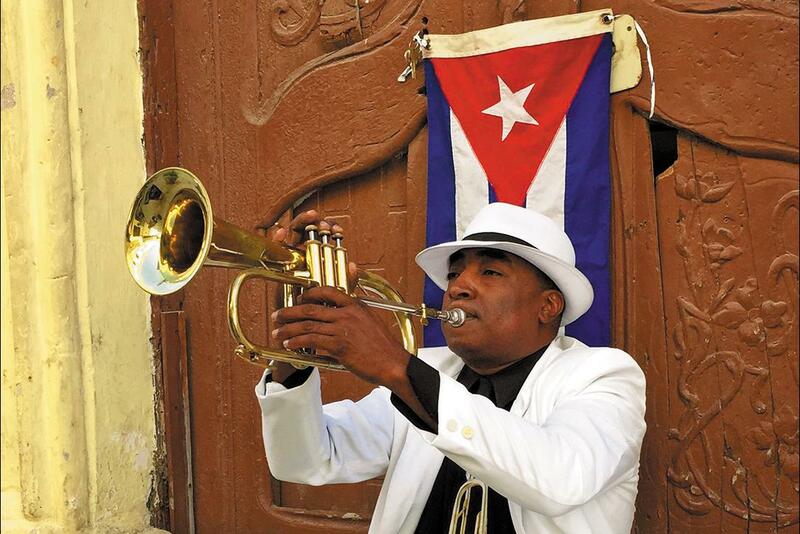 Have lunch at a small family farm near Santa Clara and head back to Havana about 1pm (approximately three hours) where there will be some time to freshen up before the farewell dinner, and of course, one final fun-filled night of music and dancing!